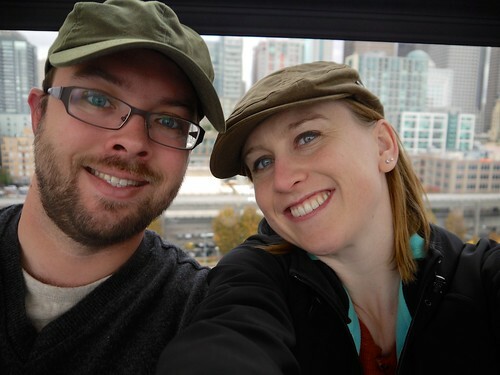 Back at the beginning of October, Josh and I visited the latest addition to the Seattle skyline, the Great Wheel Seattle (or simply known as a ferris wheel). 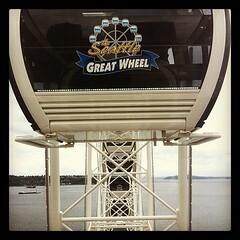 It's a pretty cool ferris wheel on the Seattle waterfront. 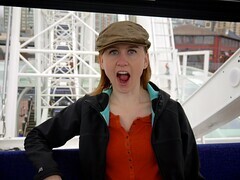 It is enclosed, so less freaky for me (recalling my freak-out going in the Chicago ferris wheel). And it keeps out the rain. Luckily, it wasn’t raining when we went around (but it rained shortly after--hey, this is Seattle, what do you expect?). You know what else? It goes around not just once, but five times. 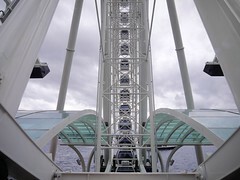 That’s five times more than Chicago’s wheel (sorry Chicago, just sayin’). 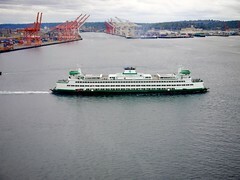 As you circle around, you can see Puget Sound, ferries, and skyscrapers. 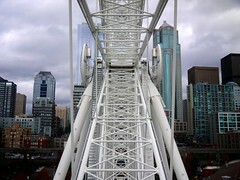 I think just the ferris wheel itself is cool. All the beams, and the shape. It just interests me. Is that weird? 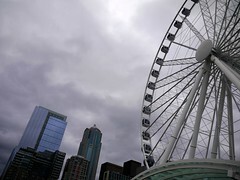 All in all, it’s a nice addition to the Seattle skyline. We enjoyed our go-around, and it was a great activity for Josh’s birthday.